Live a carefree life with Prestige 4 hob top brought to you by Snapdeal. It is designed to meet the expectations with respect to style and convenience and is considered to be world’s slimmest cooktop. With knobs placed on top, this efficient hob top comes in rectangular shape and is easily available at an affordable price. The pleasure of a home-cooked meal is very comforting and with features such as efficiency, auto ignition, and tempered glass top you can easily cook a hearty meal in no time. 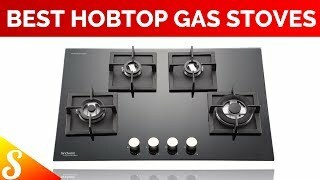 This easy to use hob top comes with a warranty of two years from the manufacturer in case of repair or damage and is a great addition to your kitchen appliances. High Efficiency Brass Burners Pirestige 4 stove comes with 4 burners and acts as a gas stove as well as a hob. They are made up high-qualityity brass and come in small, medium and large size to cater various demands in the kitchen. You can easily place dishes on the burners and multiple items can be cooked simultaneously. One other advantage is that you can adjust the heat proportionally to the temperature you need. Stainless Steel Metal Base This convenient hob top is made from high standard stainless steel and is designed in such a way that it lasts for years to follow. It is available in the colour silver and has an interesting design and body. Its sleek shape and smooth texture makes it easy with respect to cleaning and the glass top prevents it from scratches and other stains. Stainless Steel Drip Trays This Prestige 4 stove comes with sturdy drip trays that are made up of stainless steel. These trays help in protecting the surface and receive spillages. The trays being sturdy and unbreakable, Make them durable and with user-friendly features like these, this versatile kitchen tool is a must buy. Toughened Glass Cooktop Prestige 4 stove is designed and coated with a layer of unbreakable tempered glass. It has an aluminum gas cog for high thermal efficiency and with its advanced auto-ignition feature, it is easy and safe to operate. Powder coated pan supports This reliable hob top measures 72 x 20 x 56 cm (approx) in width, height and depth and are black powder coated. They have features such as rust free and easy handling of heavy dishes at any temperature.